From their organic farm located near San Luis Obispo, Cari and Craig Clark grow the majority of the produce which they infuse into award-winning vinegars and olive oils. The Clarks do everything by-hand -- from harvesting to bottling to labeling. You’ll find their vinegars in flavors like raspberry basil and fuzzy navel peach as well as their olive oils at pour-your-own-olive-oil shops like Olive This, Olive That and We Olive in San Francisco. Crackers made from seeds were trending at the show, and one of the best versions came from Katie Coleman. Hers is a toasty blend of organic flax, sesame and chia. 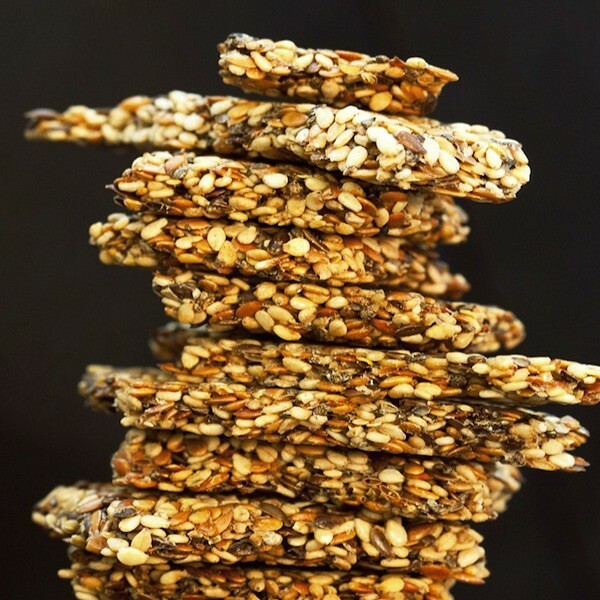 They join a line of grain-free, low-glycemic cookies, granola and nut bars born out of Coleman’s struggle to find healthy snacks that wouldn’t cause swings in her blood sugar. She was diagnosed with type 1 diabetes when she was eleven. Find the crackers online for now and available at several New Leaf Community Market locations by next month. Makers of raw, low-glycemic macaroons called “Coco-Roons,” Wonderfully Raw also produces coconut/parsnip and Brussels sprouts chips in flavors like chipotle lime cilantro and apple tamarind. They prove that kale is not the only vegetable worth transforming into a crunchy snack. Find them at Whole Foods. PBEQ is an abbreviation for pão de queijo, tapioca-based cheese breads commonly eaten as snacks in Brazil. Each two-bite roll is puffy with a hollow interior and crusty when warm from the oven, which is just how you should eat them. Founder Flavia Flores offers a carrot raisin version that has the flavor of a morning muffin and a chocolate option that teeters into dessert territory, especially when paired with a cup of hot chocolate for dunking. Find them at Northern California Cosco stores beginning March 15th. They’re currently available at Cosco in Fresno and Clovis. 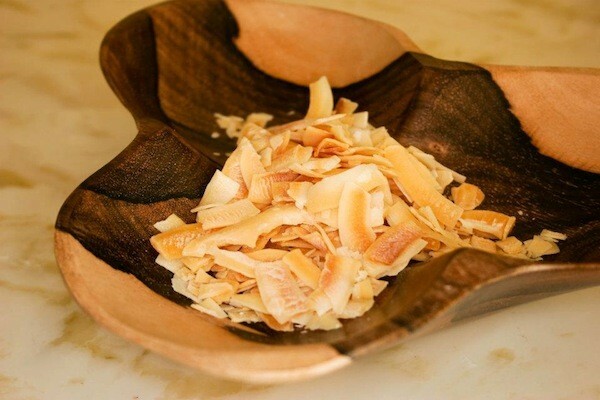 Coconut chips were raging this year, and the ones from Dang Foods were especially irresistible. Vincent Kitirattragarn roasts the meat of mature coconuts at low temperature to develop their sweetness and tint them golden. “It’s really a slow toasting,” says Kitirattragarn who named the company after his mother who grew up in Bangkok and encouraged him to start the business. New additions include a lightly salted chip and one that comes armored in a thin layer of dark chocolate. Find them at grocery stores throughout the Bay Area. Marjorie Caldwell makes one thing exceptionally well. 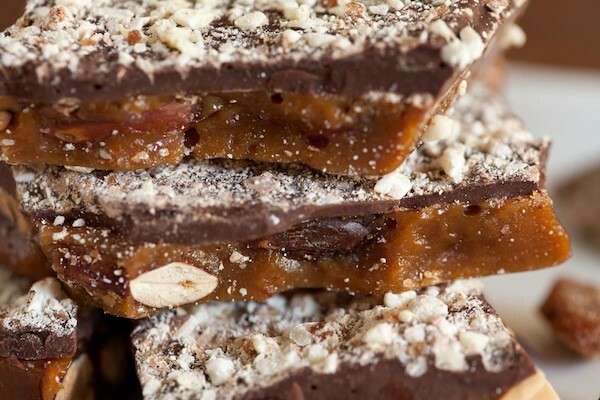 Her panforte is richly fruity made from raisins, Blenheim apricots from B&R Farms in Hollister, and cherries that she grinds with almonds, hazelnuts, a little oat and almond flours, honey and cocoa. Chewy without being sticky, indulgent without inducing guilt, you can find them online in pound and half-pound cakes. When Bridget and Tomek Piszczek got married, she traveled to Poland to meet his family and fell hard for the dumplings called “pierogi.” When they came back to California, Bridget searched for a quality substitute. “There was nothing close to what we had there,” she says. Bridget and her husband started making their own and selling at farmers markets. 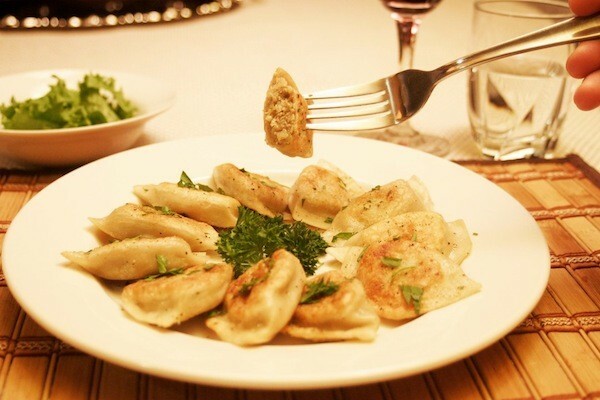 Resembling ravioli with thicker skins, their potato and cheese pierogi tastes like comfort while the mushroom and cabbage is sweet and tangy with caramelized onions. All are organic. Find them at multiple grocery stores. Lauded producers of Midnight Moon and Humboldt Fog goat cheeses, Cypress Grove has relaunched its Bermuda Triangle. This tangy, smooth pyramid of goat cheese brushed in edible ash has been reformulated with different mold cultures to prevent moisture loss and help the triangle retain its stately shape. Find Cypress Grove products at grocery stores and cheese shops throughout the Bay Area. “You can do anything you want after fifty,” says Ellin Purdom who started Toffee Talk with cousin and best friend Catherine Hughes four years ago. They make each batch in small quantities, breaking the pieces by hand, and reserving and packaging the broken bits into what they call “Crumble Mumble.” Find it at Buyers Best Friend stores in the Haight and North Beach. When Karen Schuler Hill relocated to California four years ago, she decided to leave her unfulfilling job in advertising. “I wanted to make something that was sustainable and about food and wine,” she says. D’Vine Crush makes fruit and energy bars accented with different wine varietals. Look for her new Corkscrew Cherry and Pinot bars online, at Sunshine Foods in St. Helena, and Cavallo Point Lodge. 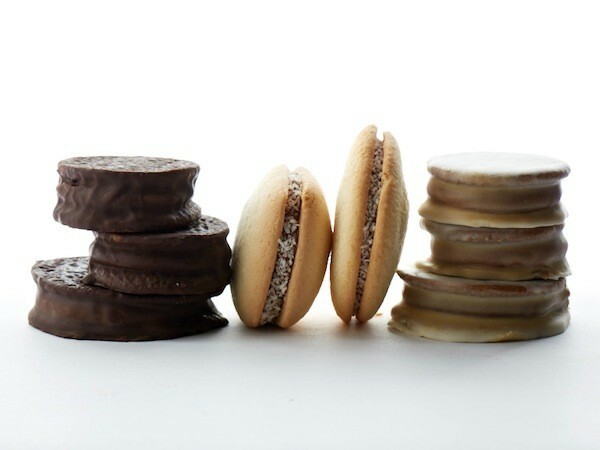 Raised in Buenos Aires, Andrea Ozzuna learned to make alfajores, traditional shortbread cookies that sandwich a layer of dulce de leche, from her grandmother. Her newest offerings include a cinnamony snickerdoodle and dark espresso. Like all of Ozzuna’s cookies, they’re made in small batches and packaged in biodegradable bags. Find them at select retail shops throughout the Bay Area.